The weather turns cold, what are you waiting to donate your used clothing? The weather turns cold and with it, the usual 'wardrobe change ': summer clothes leads to coats, turtlenecks and wool garments. This causes that during this time the textile and shoe donations will increase, which is a challenge for the Department and for the whole team of the Foundation. Based on the behavior and statistics from other years and in the current situation, in Humana redouble our efforts to ensure that the first step in textile management process is performed optimally. We reinforce those routes in which the pace of donations is higher, reaching, in some cases, to empty the containers daily. Always with an eye to providing the best service to 800 municipalities and 500 private entities collaborating. Donations growth causes further that classification plants multiply their activity, in order to respond appropriately to these activity peaks in the pickup. 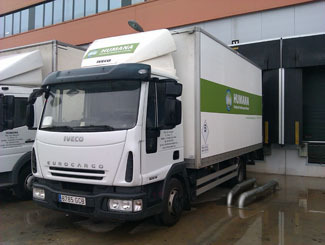 The logistics, the storage capacity of appropriate clothing to other management stations and textile shipments to Africa, especially Mozambique and Guinea- Bissau, also tested during these weeks. Now therefore, is an excellent time to make the switch cabinet and select the clothes and shoes that are no longer used. 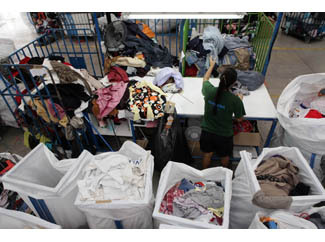 We invite you to deposit these clothes and accessories in any of the 5,000 containers of the Foundation or any of the 28 existing second hand shops. With this simple gesture will be helping with the preservation of the environment and also supporting cooperation projects for development in other countries. 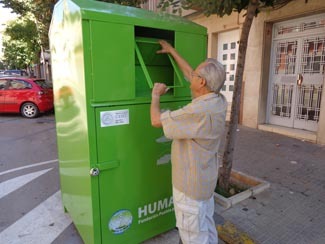 If you have any questions about where to deposit your clothes, you can call 902 170 273 or the Delegation of Humana nearest your home.